Eating healthily has to be a priority along with exercise. We all know this but if it was that easy we would all be doing it without any struggle. For me, I changed my lifestyle six years ago by not eating any more meat. That meant, no beef, chicken, pork or lamb. Out went the big fat sausages for Sunday breakfast, as well as bacon strips and greasy fried eggs. Instead I now love to have my own version of Sunday breakfast which looks and tastes delicious but has half the calories and is much more healthy. 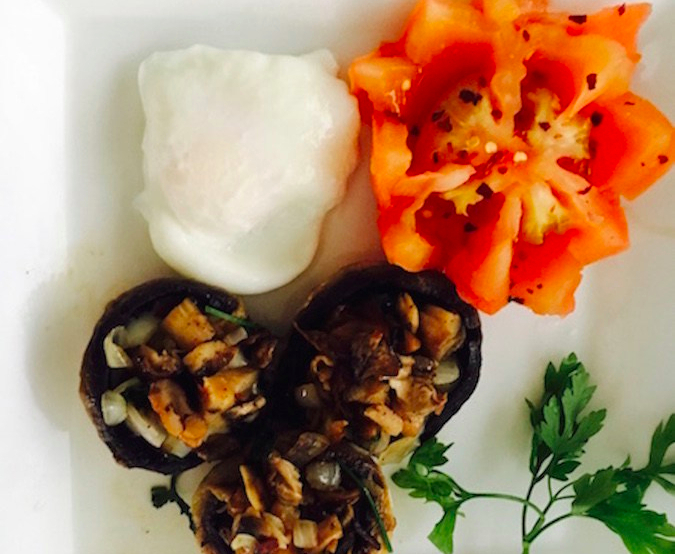 My favourite is stuffed mushrooms (simply cut up the stalk of the mushroom, add some garlic and spring onions, fry in low fat spray oil along with the mushroom case and place in the middle), I also microwave half a tomato sprinkled with chilli flakes, and poach a couple of eggs. It just feels lighter and cleaner to eat. You might think its hard to give up on meat but if you put your mind to it there are so many other options and will help you to cut down on the calories and teach you a different way of eating and be more adventurous with your cooking adding more spices and herbs, try it and see. It really isn’t too late to change your eating habits no matter how old you are, it will give you a new zest for cooking. Give it a go and if you come across any wonderful alternative breakfast ideas I would love to know about them. Previous What motivates you to excercise? Next Anything is possible, just believe in yourself, you can do it!